Looks normal enough right? 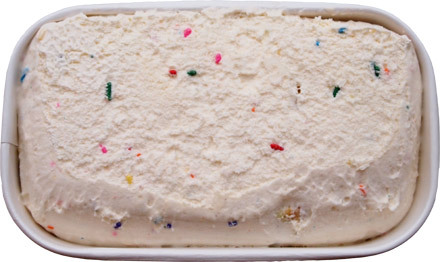 Cute full size sprinkles, a cake bite hiding near the bottom, nothing too scary.... "Cake pieces and rainbow sprinkles in cake flavored frozen dairy dessert" if you want to be official. Whoa, check out the massive air ripples! Yes, it's had time to soften up a bit, but I was using my real nice ice cream scoop that should have sliced through the frozen dairy dessert, not made it crumple under the pressure. We dig into our big bowls of frozen dairy dessert and this flavor is pretty much as expected. It's a strong (but not overpowering) cake flavor with a soft texture. The sprinkles are merely for show and add zero crunch. Now with the cake bits we had a little debate. 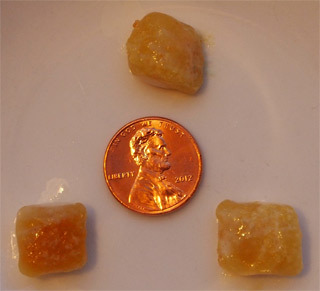 So here are the nice sized cake bits and I think they have a nice yellow cake flavor to them but for some strange reason my daughter just wasn't digging them. I can't think of anything offensive about them, but maybe she was just offended they weren't cookie bits. So overall it's not a bad addition to the BLASTS lineup, but it's not exactly going to make me a cake flavored convert either. 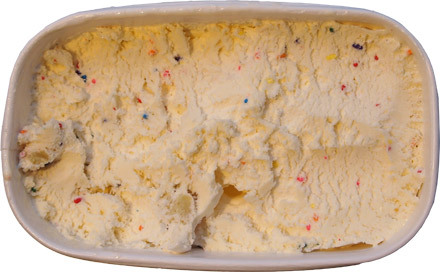 However, I do have a question: why does no one make chocolate birthday cake batter ice cream yet? It's pretty much always vanilla batter flavored with vanilla cake bits? Sure, maybe cold stone could fake something, but none of the main stream brands have tried it (both B&J flourless chocolate cake and Blue Bunny's chocolate cake aren't batter flavored specifically). Curious, I tried a big squirt of Nesquik on my ice cream, mixed it up, it turned brown... but I don't taste the chocolate. Hmmm. I go with a second big squirt and I think I detect a few chocolate undertones, but the flavor is still 90% cake batter. It's amazing how powerful that cake batter flavor can be. Oh well. Alright, that's that then. Nothing to in depth as this flavor falls into the "descent" category but not in the "best of" anything department. I was going to write a nice long winded post about new year's resolutions and finding inner peace and all the great plans I have for 2013.... but then I got tired, must like I do everyday. What you need to know is the blog isn't going anywhere. If you want in depth, sometimes technical, never biased, sometimes poorly worded, always honest, occasionally funny, always well meaning reviews, then stick with us in 2013. We do our best to keep you in the loop and I know I've said this before, but you are always welcome to comment and email and tweet and facebook and whatever else floats your boat. This is a community and I hope the blog's reviews are always written in a way to help you make a well informed decision and not just make up your mind for you. I could say everything is the best ever and not care about your wallet or your belly, or I can stay right here for another five years and continue to be a voice of reason by letting companies know that we appreciate their effort but that not everything is going to be a winner. It's funny how many times I've said "yeah, I don't see this lasting" and then sure enough, boom, bu-bye. What can I say, it's a special gift, almost a super power really... ok, now I'm just being silly, but you know what I mean. Stick around, get everyone you know to join us, and scoop on my friends. Verdict? 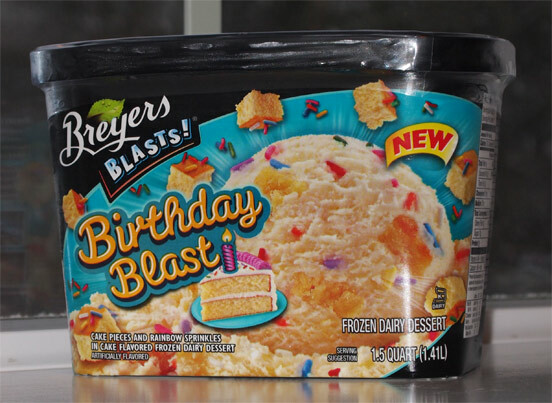 It's a cake flavored frozen dairy dessert, what else can I say? Blue bunnys has the chocolate cake flavor by duff. ha, yeah, Nick said the same thing, but it's not chocolate cake *batter* flavor, it's close though! I was thinking the same thing when you mentioned chocolate cake! I want to give this one a try, when I saw it in the store it looks a lot like the Oreo birthday ice cream they did in the spring/summer and so I walked right on by. How does it compare? Btw thanks for all you do Dubba for the blog I appreciate it and look forwward to each post! the base is very similar if not identical, though the cake bits add a bit more of vanilla vibe, that's all. I say the more cake the better, I'll def give it a try! I agree with your daughter: the cake bits are dry, and the ice cream didn't cover it like frosting normally does for me. I like the ice cream/sprinkles (agree that it is quite similar to the Oreo birthday), but I disliked the cake bits so much that I'd have to pick each of them out; I'll stick with Golden Oreo if I want a similar flavor. Well, I can tell you why I didn't dig the cake pieces. THEY WEREN'T CAKE lol. They tasted cake-ish. But the texture was like a dense, doughy goo. I was expecting something cakey, and of course dense enough to mix into ice cream without falling apart. But there's nothing remotely cake-like in the texture of the bits. Brownies in ice cream are similar to real brownie pieces; why couldn't this be more like cake? Loved the sprinkles, the flavor of the "dairy dessert" was pleasant, the texture of the gummy, cheap tasting cake pieces however, was horrible.Also, the dairy dessert had an odd texture to it as well. Will not buy again. My kids won't even eat it! It's not good at all. I recently bought it at walmart thinking - it must be divine! cake and ice-cream - who could say NO? i was a bit disappointed. The cake crumbles have such an artificial flavor to them. They were VERY sweet and leave a weird flavor in my mouth. The ice cream base and sprinkles on the other hand were very delish! I ended up eating the ice cream, but removing the cake crumbles to make it more palatable. They should just hook up with Sara Lee and incorporate that pound cake which is way better. Did NO ONE else think the cake pieces HAD to have been Play Dough? Everyone talks about their weird, doughy texture. The FLAVOR was HORRIBLE!!!!! Seriously impossible to eat, unless you like play dough. Something was def off with the cake part. Pretty disgusting. It looked like fake raw cookie/cake mix or something. I had to spit it out every time I ate one. But the rest was delish! The cake pieces tasted like raw cookie dough. This ice cream is all around YUCK! Super late comment ^_^ in regards to original post. I'm eating this ice cream, like it a lot, but probably won't buy it again. My advice or comment about the cake pieces are: should have been flakes or swirls. :3 Not bites. Its nasty i was super disappointed they really need to stop making it i feel bad for anyone that buys this its nasty!!!!! Are you ppl serious? I feel like a freak show. I eat very healthy, but I always have this around for a cheat day. I absolutely love it. Never be ashamed of what you do or do not love. We all have very different tastes. If it makes you happy, rock on. This is the best ice cream I have ever tasted...I am not joking, I wish there were even more cake pieces. I hope Breyer's never stops making this!!! 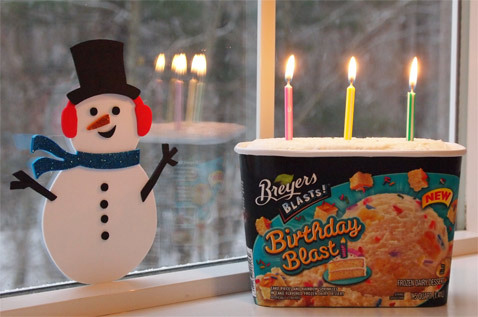 I'm an ice cream addict but this party blast ice cream want really not good. It has chunks og cookie dough & is quite distasteful. I couldn't even decide if I like the ice cream without eating the chunks. I will stick to Breyers vanilla! One word,"disguting". It tastes disgusting and this flavour actually ruins the ice cream. My wife bought it to celebrate our cat's birthday witnout buying a cake. we would have been better off buying something from Dairy Queen instead. This is my favorite ice cream.